i got woken up with really bad news this morning... it's just not a good start to your day! i'm forcing myself to get moving and accomplish things because, obviously, sitting around feeling sorry for myself isn't going to fix any problems. here's to a happy weekend! i haven't done a comparison post in a long time, so i decided to rectify that today! 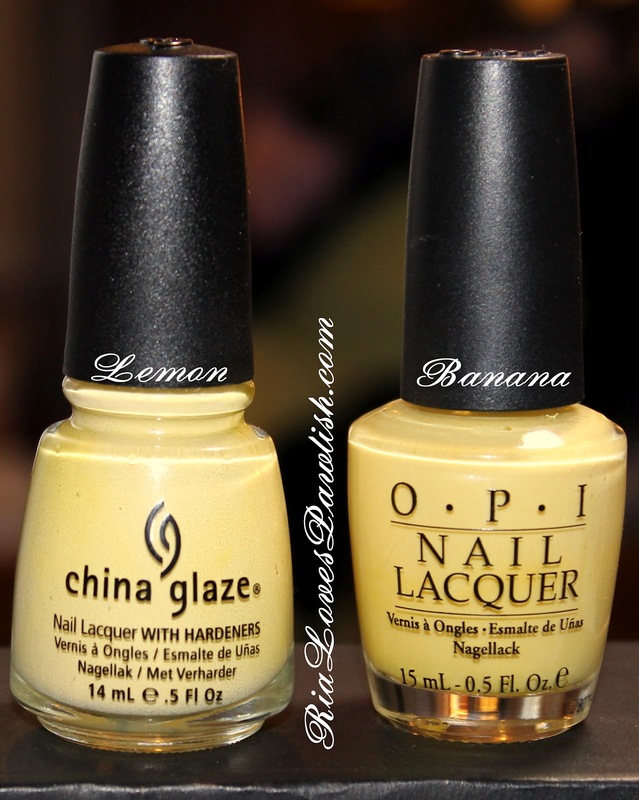 yellow creams is the name of the game and we are pitting China Glaze Lemon Fizz against OPI Banana Bandanna. China Glaze Lemon Fizz is the clear winner! it's a bright pastel (seems contradictory, but it's true!) yellow that is opaque in two coats. the formula is super easy to work with and doesn't have any of the streakiness that generally plagues yellows. China Glaze hit it out of the park with this one! OPI Banana Bandanna is an okay polish. it's still not quite opaque at three coats and the formula is pretty runny. the good news is that it didn't try to bubble, so you could potentially pack on the coats until it became opaque. after i added topcoat, the polish smoothed out to be *almost* opaque, which is why you can't really see the nail line in the swatchie! the color is slightly darker than LF and seriously reminds me of gloopy egg yolk. both polishes are over one coat of Seche Base and under one coat of Seche Vite! I have Lemon Fizz and now I'm very glad I do. wow, India! i've never been, but it looks so beautiful!